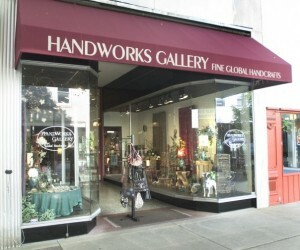 Fine American Handcrafts and Global Art. Jewelry, Pottery, Garden Art, Scarves and Handbags, Incense and Soaps, Instruments and Toys, Myriad Adornments and Accessories for Body and Home. Hours of Operation: Autumn Hours: Monday: Hours Vary Tuesday: 10-5 Wednesday: 10-5 Thursday: 10-5 Friday 10-6 Saturday 10-5 Sunday 12-5 Hours change throughout the year -check Facebook for current hours. Recommended Parking: Park either at a metered spot on Piccadilly St or in the George Washington Auto Park on Cameron St.